Upside down dolphins and killer whale or orca. Credit: Flickr/Rumpleteaser. CC BY 2.0. For those tens of millions of us who have been watching the extraordinary ‘Blue Planet II’, the final programme in the series (which looked at the human-caused threats facing the seas) may have come as both a wake-up call and a disappointment. Disappointment, at what we’ve done to this beautiful planet. And perhaps also, disappointment that the BBC didn’t look deeply enough into why these harms have happened. The background to what we’re doing to the oceans includes, crucially, this: that the world is possessed by the ideology of possessive individualism, which comes in different varieties: liberal, neoliberal and libertarian. This possession is utterly disastrous, at a moment when we need to think and act collectively, politically, and as a civilisation, not just as an aggregate of individuals. What would it mean to really take seriously our identity as a ‘we’, our belonging to each other and to our homes—our common home? To be us, rather than just a lot of ‘me’s? Central to such a transformation is the need to overcome the prejudice—the very idea—of the ‘individual.’ It is not persons who are the fundamental units of social existence, it’s embedded communities. We are born into community, and in this respect our political starting point should never be the fantasy of the ‘social contract.’ That fantasy, of the individual-as-person allegedly prior to society, dangerously gets in the way of the ultra-long time-scale of community. Individuals die. The community lives—unless it stupidly commits itself to death. We humans seem very far from understanding this at present. The situation is pretty desperate. Might we be able to learn from other animals who seem, in the ways they live, to have a better grasp of this crucial point? Could other animals possibly have anything to teach us? And even if they did, how could we understand it? Or consider Hal Whitehead and Luke Rendell’s well-regarded book, The cultural lives of whales and dolphins, with its audacious title about the cultures of these beings—really? Are they genuinely cultural? Roughly speaking, a culture exists if there are substantial specific traditions that are inherited by way of teaching, learning and emulation, rather than by way of genes. Whitehead and Rendell show that there’s little possibility of debate over this question when it comes to cetaceans like whales and dolphins, which are social species with their own cultures. Take a famous example: Humpback Whales singing. It’s now been shown that different groups of Humpbacks alter their songs in patterns that look much the same as human fashions. We are still somewhat far from understanding what these songs mean, but we already know enough to see that they’re far more clearly cultural than most bird songs. We can probably understand all of these phenomena to some degree by rough analogy to ourselves. And it’s truly extraordinary that cetaceans have managed to maintain and develop their cultures when one considers the quite fantastic butchery that they’ve been subject to at human hands over the past few centuries. Imagine humanity, from a far lower initial base of numbers, being then taken down murderously to about a thousandth of its size, and what that would do to our cultures. This is what we have done to cetaceans. It is incredible in its barbarity, cruelty and stupidity. It is soul-rending. And yet, they manage to go on. 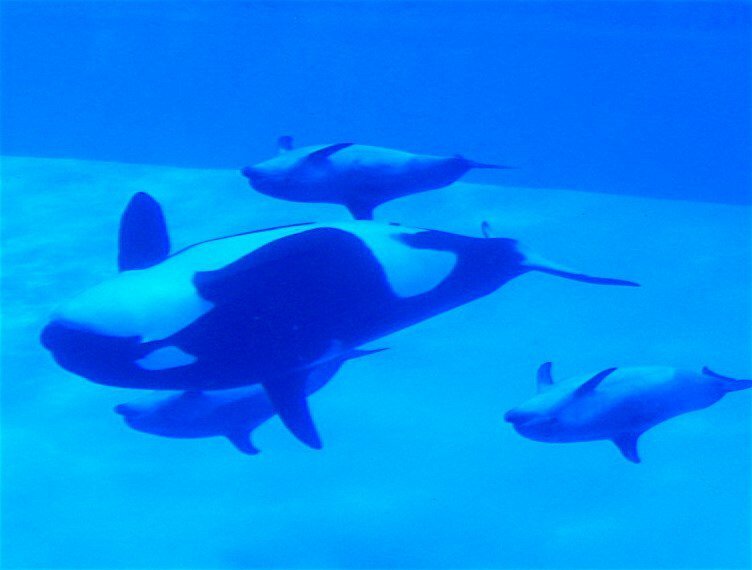 Whitehead and Rendell suggest that another mark of culture, which we should look for in cetaceans to confirm that the adjective “cultural” is appropriately applied, is social stupidity—it is possible for cultural beings to be stupid or sub-optimal in ways that are not open to uncultural beings. Stupid social behaviour like this is very unusual in the animal world, though more often than not, we’ll assume that animals lack the cognitive capacity to be capable either of relevant intelligence or stupidity. However, Whitehead and Rendell offer a powerful example of cetacean behaviour that could be considered stupid in this way: mass strandings. Some mass strandings can be explained by reference to pollution that makes the cetaceans in question ill; or by reference to the sonar with which our navies are filling our seas, indiscriminately and highly-destructively. But there are plenty of cases which don’t fit this kind of model, cases where one or some of the pod are beached ill or wounded while others are fit and healthy. It certainly appears stupid that the latter are unwilling to save themselves even when their conspecifics are doomed, unless we change the frame and, instead of asking repeatedly, ‘Why won’t this dolphin save itself, or even allow itself to be saved?’, we step back to think about whether the notion of ‘self’ in play here may be prejudicial. Perhaps the cetacean sense of self transcends what for us are divisions between individuals. To understand cetacean society, we have to let go of philosophical and ideological assumptions about the separateness of living beings from one another, assumptions which seem natural to us re human beings—though perhaps only because we are so deeply captive to an ideology of individualism: we don’t see it, for it’s the sea we swim in. Instead, we may have to contemplate the lived reality of what we would call ‘larger-than-self’ individual as indivisible identities. Then we might be better placed to think as a civilisation and to survive, for we would feel directly the reality of all the others who we are committing to suffering or death through our actions—and maybe then, we wouldn’t be able to go on doing these things. Cetaceans expand our sense of what is humanly possible vis-a-vis relationships and community. Or perhaps they exceed it. They indicate a spectrum along which we are far from reptiles (who have no interest in their own young, and will eat them if they come across them), but perhaps not quite as advanced as cetaceans. What kinds of beings do we need to become in order to survive the coming ecological devastation, and in order to avoid accelerating it beyond the range of civilisational survival? I would say: communitarian animals, not libertarians, liberals or neoliberals. I think cetaceans present us with an enormous clue as to what that could mean, if we are willing to hear them. Maybe reflecting deeply on how cetaceans do sometimes walk willingly into mass strandings might help us to figure out how not to walk into our own global suicide, because, in a way so wonderfully, they’re unable or unwilling to imagine leaving each other, as we see played out in the incredibly-moving way they actively resist being saved. But perhaps we’re only doing so because, unlike them, we find it too easy to imagine leaving each other, and in particular, leaving our children to their fates. Maybe we can learn to be more like cetaceans—who simply will not do this. Thanks to Silvia Panizza and Sam Earle for really helpful comments on earlier drafts of this piece.